Jeff Harding is the newest member of our team. 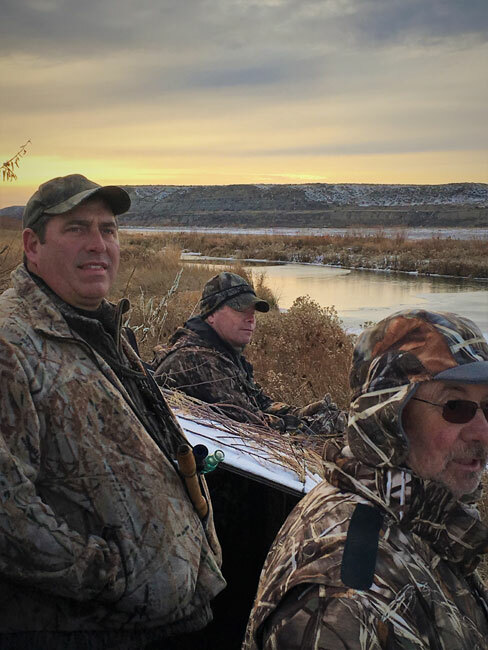 Todd and Jeff have been friends and hunting partners for over 15 years and few Thursdays pass without them hunting, fishing, or doing something outside together. Jeff and his family own Harding Land and Cattle Company with an irrigated farm northeast of Miles City and a ranch east of Miles City. The addition of these properties to Triple T Outfitting has expanded the variety of terrain to hunt deer and antelope as well as added waterfowl as an option to our hunts. Jeff and his wife Kristine have three children, Mason (the oldest), Kaden, and Kinley (the youngest and only girl). They kids are all outdoors oriented with Mason and Kaden being both bow and rifle hunters and Kinley wanting to do anything her brothers do (she shoots already better than they do). Jeff has hunted across the globe, but finds the most fun outdoors is sharing his love of their ranch and the joy of ducks or geese over the decoys. In Jeff’s eyes whether it is scouting, chasing birds, tracking deer, or finding fish, no day outside is wasted.